Red onions --- 2 ea. White onions --- 2 ea. Roasted garlic cloves --- 2 ea. Debone rotisserie chicken; keep warm. In a large pot, sweat red and white onions until translucent. Add thyme, sugar, vinegar and TABASCO® Sauce; cover with a lid and let simmer for 30 minutes. Make a garlic aioli: Smash roasted garlic into a puree and combine with mayonnaise. Split focaccia into tops and bottoms; toast both cut sides. 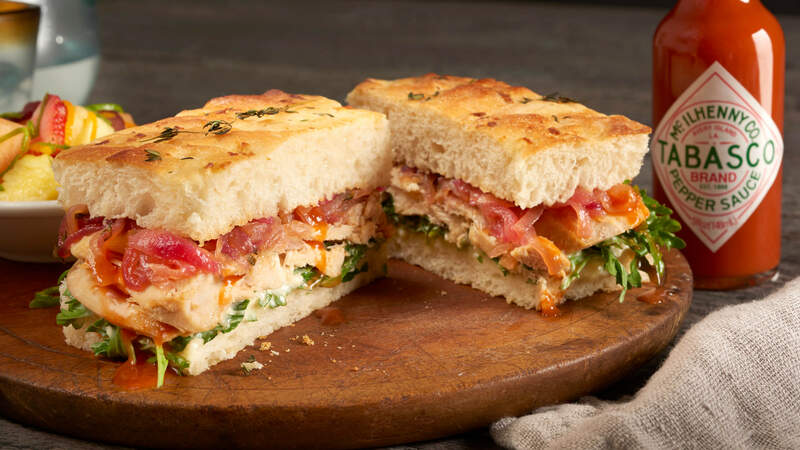 For each sandwich, spread garlic aioli on both sides of focaccia; lay baby spinach on bottoms, place one-quarter deboned chicken over spinach; place 1/4 cup braised onions over chicken. Close each sandwich with the tops of focaccia portions, and serve.